The Optimus L9 uses the standard Android ICS gallery. It automatically locates images and videos no matter where they are stored. By default, images are sorted by albums, but you can sort by location or time as well. The different sets are tiled neatly across the screen, and opening the contents of a group of photos causes them to transition into the same grids. Once selected, you can view an image close up by pinch zooming or double tapping on the desired area. There is a sliding gallery along the bottom which allows you to quickly browse other images in the album. On the top there are three shortcuts for quickly sharing, editing or deleting the selected photo. There are plenty of editing options available, ranging from photo effects to cropping and rotation to red eye removal. The Share feature offers quick sharing via Email, Google+, Picasa, Memo, MMS, SmartShare, Social+ or Bluetooth. The Gallery app displays images in full resolution. Zooming and panning is fast and smooth and there's little to no lag when doing it. The music looks similar to the typical ICS version we're all familiar with, but steals a few tricks and UI elements from the revamped app we saw in the Optimus G. It can do the usual filtering by album and artist and you have alphabet search and regular search for finding songs quicker. The Now playing interface places a big album art image in the center with controls above and below it. Swiping the album art left or right is the easiest way to skip songs back and forth. The interface now has a metallic look to it instead of the dark grey theme of old. A press and hold on the album art will bring up a search menu, if you need to look up the title, artist or the album. After that you can pick where to search - your music collection, YouTube or a general Internet search. There are equalizer presets, which become available when you plug in a pair of headphones. Unfortunately there is no Dolby Mobile enhancement and no option to customize your own preset. When you're playing a song it also gets displayed in the notification area, where you can pause and change tracks. The LG Optimus L9 did quite well in our audio quality test and easily put its premium 4X HD sibling to shame. When connected to active external amplifier the LG Optimus L9 managed excellent scores all over the field and garnished them with above average volume levels - a pretty solid performance. There was some degradation when we plugged in a pair of headphones, but nothing too bad. Some distortion crept in and the stereo crosstalk worsened, but none of those will be easy to detect with the naked ear. 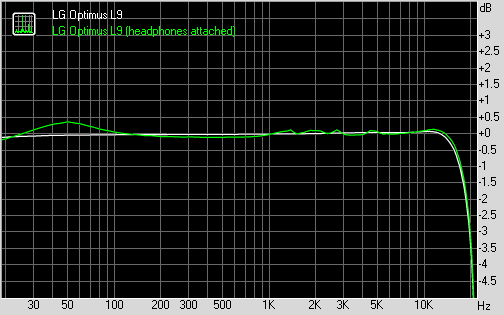 The drop in volume levels meant the L9 is only average on this occasion, though. There's an FM radio on the LG Optimus L9 with RDS support. It can play over a set of headphones or the loudspeaker, but the headphones need to be plugged-in either way (they act as an antenna). You can also scan for radio stations, and save up to 48 channel presets. The video player has a fairly simple interface, giving you just a list (with thumbs) of all the videos on the device. There's an alphabet scroll to help users locate videos faster but that's about it. You can of course play videos from the Gallery if you prefer its folder-centric organization. The available controls during playback include a scrubber for jumping to various parts of the video along with the standard play/pause and skip buttons. There's a lock button too, which hides all controls for pure full-screen viewing. 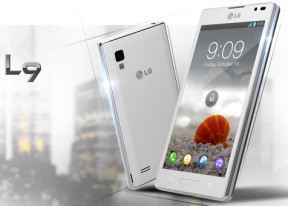 The LG Optimus L9 handled everything we threw at it - DivX, XviD, MKV and MP4/MOV up to, and including, 1080p resolution. Unfortunately the AC3 audio codec is not supported and some of the videos played without sound. There are no limitations for the bitrate, file size, etc. Subtitles (both Latin and non-Latin) are supported with settings for font, color, font and size. You can toggle subtitles on and off, but there's no option to manually point to a subtitle file, so the subtitle filename has to match the video filename.